That is pretty clear, isn’t it? And it is a particularly apt reminder on the day that we celebrate the Holy Trinity. This is a particularly difficult doctrine and one over which there has been a lot of conflict over the years. I am not going to try to explain it, because it is as much a mystery to me as it is to anyone else. And, I do not have all the right answers here. But I can share a few illustrations and thoughts. All of which are not the whole story and have their limitations, but perhaps they might help us to think about the Trinity in a new way. First, a story from St. Augustine: One day St. Augustine was walking on the beach when he encountered a little boy trying to pour the whole ocean into a hole he had dug. When Augustine told him what he was trying to do was impossible the little boy said "neither can you fit the Holy Trinity into your tiny mind." 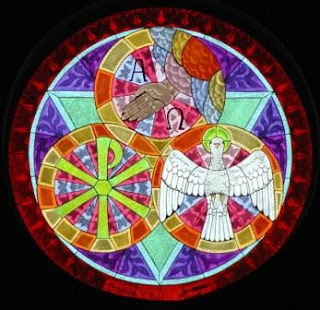 From there St. Augustine offers this illustration of the Holy Trinity (and it is one of my favorite images): When you think of the Trinity, think of love – God the Father is the lover, the Son is the beloved and the love shared between the two is the Holy Spirit. Here’s another, from the Desert Fathers: Think of the Holy Trinity as Light – The source of Light is the Father, the light itself which provides the illumination is the Son and the warmth one feels from the light is the Holy Spirit. And one more, from Meister Eckhardt: When the Father laughs at the Son and the Son laughs back at the Father, that laughter gives pleasure, that pleasures gives joy, that joy gives love, and the love is the Holy Spirit. Finally, allow me to share that for me the Holy Trinity is primarily about relationship. The Trinity is a relationship within God’s self of Father, Son and Spirit, but it is also how God has chosen to relate to us and how we experience God. The Father, Son and Spirit define our relationship with God. It is so easy for us to fall into a focus on one person of the Trinity over the others. Some Christians relate to Father, some focus on Jesus, some on the Spirit. But to do this is like getting a bike for Christmas and instead of putting it together so you can ride it, you pull out the seat or the frame or the wheels and play with that part and ignore the rest of the bike. You aren’t going very far on that bike if you do that. Similarly, we limit our own experience of God when we focus on one person of the Trinity and exclude the others. This is one reason we regularly remember our Baptism and Luther encourages us to make the sign of the cross – this keeps us grounded in the Holy Trinity: Father, Son and Spirit. And lastly, in Baptism we are brought into this relationship that God has within God’s self, and we become a part of the relationship within God and this should define our relationship with others. The images above lift up joy and laughter, light and love. This is the gift the Trinity offers to us and the gift we are called to allow God to reflect to others through us. In the Isaiah text, the prophet fears that he is about to be destroyed because he has gotten so close to the divine, but in fact he finds that being brought into God empowers him for service. In the same way, Baptism empowers us for service as well. Here I am, Lord, take me – in the name of the Father, Son+ and the Holy Spirit. Amen!